How would you like your claim to fame to be that you help federal employees choose the best date to retire? Well, that’s mine -- thanks to my good friend, Mike Causey, who helped me claim that title in the early 1990s. I can think of worse things to be known for. Under both the Civil Service Retirement System and the Federal Employees Retirement System, if you retire on the last day of the month and are eligible for an immediate retirement (meaning you meet the age and service requirements for an immediate optional retirement, as opposed to a deferred retirement or involuntary retirement), you will be paid your salary for your last month of service and will receive a retirement payment for the following full month of retirement. For example, federal employees who retire on Dec. 31, 2012, will be paid their salary for the entire month of December and will be entitled to receive a retirement payment for January 2013. Sometimes this is referred to as “continuous compensation.” The end of the month is traditionally considered the best date for a FERS employee to retire. But that may not always be the case for every employee. Under CSRS and CSRS Offset, there is a three-day grace period, meaning if you choose the first, second or third day of the month as your retirement date, you will be eligible for an annuity for the remainder of that month. For example, if a CSRS employee retires on Jan. 3, 2013, he or she will be paid their salary through that date and will receive a retirement benefit for the remainder of January. This is a better date than the end of December 2012 for CSRS employees because they will be paid their salary for Jan. 1 to Jan. 3 and will have to come to work only two of those three days, since Jan. 1 is a federal holiday. Choosing this date also adds three more days of service to your career, which could add another month to the computation of your retirement benefit if you have 27 to 29 days left over in your “years-months-days” of federal service (with sick leave added in). But if you’re under FERS, remember: If you retire in the first few days of a month, you’ll receive your salary for the days you worked, but you won’t get a retirement benefit for the remainder of the month. Would retiring on Jan. 12, 2013, be better than Dec. 31, 2012? Possibly, because you would earn a full paycheck for those two weeks of work and another accrual of annual leave for completing another 80 hours of work. You also would be credited with another 12 days of creditable service. As noted above, this could add another month to the computation of your retirement benefit. The trade-off for retiring in the middle of the month is you won’t receive a partial retirement check for the rest of that month. For some employees, especially those with less than 20 years of service, a paycheck could be worth just as much as a month’s retirement benefit. A few other benefits of working into the new year are you would continue to be able to contribute to the Thrift Savings Plan, add some Social Security-covered wages to the new year (if you are covered by Social Security) and be able to use your flexible spending account for that year. Many employees like to retire before the end of the leave year so they can receive the maximum lump-sum annual leave payment. At the end of 2011, according to OPM, approximately 22,000 employees retired from federal service. The strategy involves saving up your annual leave accruals throughout the year leading up to your retirement so you have a balance that will be converted to a lump-sum payment when you leave. It is not uncommon for federal employees to carry over 240 hours of annual leave into the year they plan to retire and then work all 26 leave periods (27 in some years). At an hourly rate of $31.15, the payment for the total of 448 hours of annual leave would be $13,955.20 (before taxes). You will be subject to income taxes on this payment, but you won’t pay retirement contributions, insurance premiums or TSP contributions. Additionally, the payroll office will deliver your annual leave lump-sum payment two to eight weeks following your retirement, and it will be taxable in the year it is received, not in the year you earned the leave. If Congress approves an annual pay adjustment, then the leave payment would reflect the increased pay rate since the lump sum is paid at the salary the employee would have received if allowed to expire the leave by using it. There is a special rule in the COLA-locality pay legislation, however, that allows federal employees who retire on or before Dec. 31, 2012, to “buy back” some of their COLA to count as if it were locality pay for their retirement. If you retire after that date, then you will not have the opportunity to pay this deposit and therefore some of your salary rates used to compute your high-three will not have the full locality rate phased in. This will affect the amount of your retirement. Here’s an excellent resource for more information. Currently, FERS employees receive credit for 50 percent of their sick leave balance, which is added to their length of service to compute their basic retirement benefit. For example, a balance of 1,800 hours of unused sick leave would be reduced to 900 hours. Those 900 hours would be worth an additional five months and six days of service added to the actual years, months and days of federal service performed. If you were going to retire on Dec. 31, 2013, I might suggest you wait until the end of the leave year (Jan. 11, 2014) to retire instead. This way, you would receive full credit for your sick leave and you would still be retiring within the 2013 leave year, so you would be paid for all your accumulated and accrued annual leave. Retirees are granted annual cost-of-living adjustments to their benefits to offset the effects of inflation. CSRS retirees get immediate and full COLAs based on the rise of the Consumer Price Index. The 2011 COLA for CSRS retirees, Social Security recipients and military retirees was 3.6 percent. CSRS retirees saw the full increase in their Jan. 1, 2012, benefit check if they were retired for the entire 2011 rating period, which was from December 2010 to November 2011. Those who retired partway through the year received a pro-rated COLA. Most FERS retirees receive a COLA when they are retired and older than age 62. FERS employees don’t receive a COLA if they retire before age 62 unless they retired under special provisions for law enforcement, firefighters or air traffic controllers, or if they retired under disability retirement. The FERS COLA is a “diet” COLA, meaning that in years when the CPI increase is 3 percent or higher, they receive 1 percent less than that. Since you can’t know the COLA for the next year at the time you plan to retire and since it is pro-rated for the first year (or not payable at all in the case of most FERS retirees who are younger than 62), it is not a major factor in choosing your retirement date. If only you knew what it would be ahead of time, then it would make a difference. For example, if a CSRS employee retired on Nov. 30, 2010, instead of Nov. 30, 2011, he or she would have received the full 3.6 percent COLA on Jan. 1, 2012. That would have been more than the increase in their high-three salary, since a pay freeze was in effect and they would only receive a 2 percent increase in their retirement computation for working the additional year. Start by looking at the calendar for the year you plan to retire. Check out the end of each month. 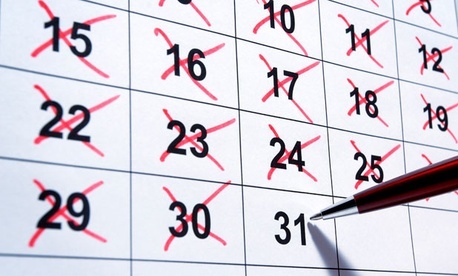 Do any of the months end at the end of a leave period, when you can get one last accrual of annual leave and sick leave? Then think about what else you're trying to accomplish. Do you want to maximize your Thrift Savings Plan contributions and take advantage of flexible spending account benefits before you retire? If so, be sure to allow yourself enough time to make the full annual contribution to your TSP and plan foreseeable medical expenses such as dental appointments and eye exams before your retirement date. If, on the other hand, you're looking for a big lump-sum annual leave payment, look at the end of the leave year. Of course, you might have other unrelated issues to consider, too. I helped a mail carrier pick his retirement date one year, and one of his concerns was making sure he was gone before holiday catalogs started to show up in his mail sack.